Munchkin's monsters have discovered the bastions of Castle Panic and they are unleashed! 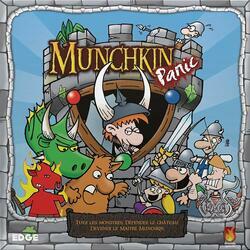 In this mix of the two bestsellers Munchkin® and Castle Panic®, players negotiate and combine their cards to defeat the monsters before they destroy the castle. Each monster becomes a trophy and gives a treasure to its winner. Work hand-in-hand to keep monsters from crushing the castle. And add a good pinch of perfidy to receive the coveted title of Master Munchkin!